The 12th annual “A Taste of Santa Cruz,” at the Santa Cruz Boardwalk’s Cocoanut Grove Thursday, Nov. 10, features 30 restaurants, wineries, and breweries. The event runs from 5:30-9 p.m. and benefits first-time home buyers. Tickets are $40 in advance or $50 at the door. 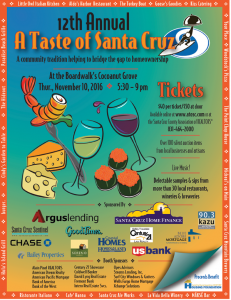 Buy tickets online or at the Santa Cruz Association of REALTORS (2525 Main St., Soquel). For more information, visit the site atosc.com or call 831-464-2000. Attendees sample food and drinks, and all proceeds from the event benefit the Santa Cruz Association of REALTORS Housing Foundation grant program that provides closing costs for first time, low-income home-buyers in Santa Cruz County. Several hundred people attend this event, raising approximately $30,000 annually. Over the years, more than $430,000 has been awarded to 200 families and individuals. Purchasing your tickets in advance is recommended. Participating food providers include Home (the new restaurant from chef Brad Briske, in the former Main St. Garden location), The Hideout, Aldo’s, Café Hanna, Paradise Beach Grille, Hula’s, Burger, The Point, Little Owl Italian Kitchen, Ristorante Italiano, and Woodstock’s Pizza. Breweries include Santa Cruz Ale Works. Other highlights include more than 100 silent and live auction items from local businesses and artisans. Prizes include a San Jose Giants package (10 general admission tickets plus a family pass for two adults & two kids); tickets to places like Gilroy Gardens and Winchester Mystery House; wine including bottles from Beauregard; and handcrafted wood pieces by artist Andy Orsini. There is also live music with the Jazz Birds & Friends. There are several food- and wine-related events in the Santa Cruz and Scotts Valley areas this weekend; here are three going on tonight, Friday Oct. 28 — actually they all start in the late afternoon, at 4 or 4:30 p.m., depending on the specific event. Food Trucks A Go Go has organized dinner & a movie at Scotts Valley Community Center. The original venue was the outdoor Skypark one block away, but that was changed due to the rain forecast. Dinner service is from 4:30-7:30 pm. The movie, Transylvania 2, begins at 6:30pm. Valley Churches United is hosting a Beer & Wine Garden and is also collecting canned goods. 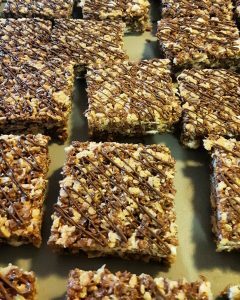 People who come dressed in a Halloween costume and who make a canned good donation will receive a treat. 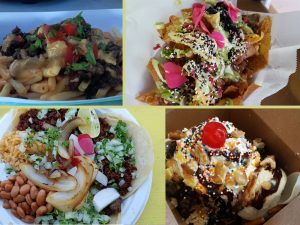 The food truck line-up is Ate3One, G’s Mexican Tacos, Aunt LaLi’s and Choke Coach. Chef Rachel Hughes of Tanglewood Catering is collaborating with MJA Vineyards for Pop Up in the Cellar: Halloween by Tanglewood at the Westside Santa Cruz wine tasting room. The menu is influenced by Halloween and the wines of MJA. Food will be available from 4 p.m. until it’s sold out; items are sold individually. The menu is Carrot Ginger Soup with a Sour Cream Web ($5), Meatballs in a Red Sauce with Alfredo ($8), Green-eyed Deviled Eggs with Red veins ($6), Bleeding Panna Cotta ($7) and Medusa Chocolate Mousse Cake ($7). There will be a costume contest as well. My Mom’s Mole is doing a “Dia de los Muertos” night of dining and dancing at the Food Lounge. Costumes are encouraged. It starts with Happy Hour from 4-6 with dinner service from 5 to 9 pm (or until sold out). There will be rueda de casino (Cuban-style salsa) dance throughout the night. Beverages (beer, wine, cider & cocktails) will be available from the bar. The food choices will be roasted chicken, pulled pork, roasted root vegetables, and wild rice & butternut squash with fall herbs, all served with My Mom’s Mole (vegan), Mole Poblano (Gluten Free), or Mole Verde (Gluten Free). 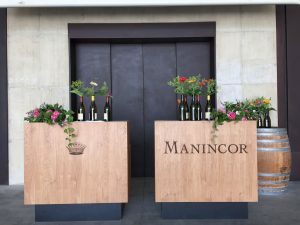 On Saturday, Oct. 15 from 2 to 4 p.m. Soif Wine Shop – connected to Soif Restaurant – is hosting Count Michael Goëss-Enzenberg, the proprietor of Italian estate Manincor, for a tasting event. The cost is $20 which includes wine and snacks. Reservations are required; email alyssa@soifwine.com to reserve a seat. Date/Time: Saturday, Oct. 15, 2-4 p.m. If you’re lucky enough to be in Santa Cruz on Friday, Oct 7, you have an incredible array of one-night-only food choices. Here are details for three events. Ocean2Table will be at the Monterey Bay National Marine Sanctuary Exploration Center selling dinner from 5 to 8 p.m. The Pescatarian Popup will showcase three items: wild morel mushroom soup ($8), fresh sablefish tacos ($12) and fresh sablefish cakes ($8, similar to crabcakes but made with Monterey Canyon sablefish). Ocean2Table is participating in honor of an event at the Center which celebrates the Leatherback Sea Turtle. Location: POPUP, 1108 Pacific Ave.
Several food/drink vendors are participating in the “Choose Santa Cruz” pop-up market at design agency Cosmic from 5-9 p.m. Food and drink vendors include Coffeeville, Makse Bar, Farmer Freed Culinary Salt Blends, Companion Bakeshop, Santa Cruz Winegrowers Association, and Lupulo Craft Beer House. Other participating local businesses include Childish Santa Cruz, Agency, Hive & Hum, A’zaht Designs, and Glow Candle Lounge (soon to open on Pacific, candle-making studio Glow is an offshoot of Petroglyph ceramics studio). The City of Santa Cruz Economic Development Office is celebrating the one-year anniversary of the Choose Santa Cruz brand and web site. They are also launching the Choose Santa Cruz coloring book, a collection of drawings from local artists of their favorite sights and scenes around Santa Cruz. The books will be available for sale at the event and online afterwards, and there will be space available, along with colored pencils (supplied by Palace Art), for people to color in books they buy. Location: Design by Cosmic, 115 Cooper St. Attention fine wine, spirit and beer lovers: the Santa Cruz Food Lounge is hosting events you can enjoy on Thursday, Friday and Saturday Aug. 18-20, 2016. 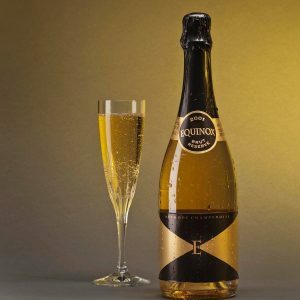 The event is from 5:30 to 8:30 p.m. with local spirit maker Sean Venus of Venus Spirits. At 5:30, doors open and the kitchen begins serving food; there is a limited selection that night (cheese plate and/or chicken entrée) and people can pre-purchase online to receive a discount and ensure the food doesn’t sell out. At 6:30 p.m., guests will learn the story behind the local distillery and the craft of making spirits as Venus leads attendees through six tastings of his award-winning agave, gin, and whiskey. A special crafted cocktail by Venus mixologist Andrew Hansen will conclude the evening. Cost for the spirit tasting and talk is $25; buy tickets at eventbrite.com. 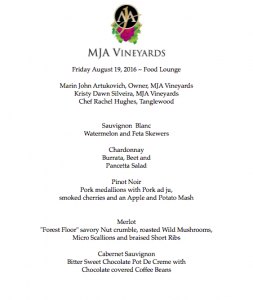 Chef Rachel Hughes of Tanglewood Catering is collaborating with MJA Vineyards for a multi-course dinner with wine pairings beginning at 6:30 p.m. Kristy Dawn Silveira and winemaker Marin Artukovich of MJA Vineyards will be present. Wines served will be Sauvignon Blanc (paired with watermelon/feta skewers), Chardonnay (with Burrata, beet and pancetta salad), Pinot Noir (pork medallions with smoked cherries and apple/potato mash), Merlot (“Forest Floor” savory nut crumble, roasted wild mushrooms, micro scallions and braised short ribs). The dessert course is Cabernet Sauvignon with bittersweet chocolate pot de crème with chocolate-covered coffee beans. Tickets are $75 with wine and $65 without. Buy online at eventbrite.com. The Food Lounge debuted a summer beer garden series in June, and it continues today from noon to 7 p.m. There will be many beers available plus German-style food. There is lots of patio seating and a relaxing atmosphere. Free admission; attendees pay separately for food and drinks. The event is pet- and family-friendly. 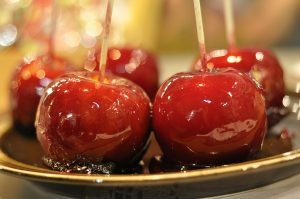 There are many food and wine and events this weekend in the Santa Cruz and Monterey area. Here are details on three occuring Sunday, Aug. 7: a fun waiters race at Soif, a delicious seafood and wine popup with Ocean2table and MJA Vineyards, and an epic benefit at the Monterey Bay Aquarium with more than 20 chefs and wineries. 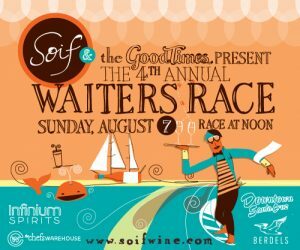 Soif Restaurant & Merchants is hosting the fourth annual Waiters Race on Walnut Avenue. As in previous years, three-person teams from several area restaurants will navigate an outdoor course, demonstrating many of the skills members of the service industry bring to work every day. The event is billed as “not only a friendly competition among area restaurants, but also a celebration of the skill and dedication of members of the service industry.” This event is free; teams from Soif, Woodstock’s Pizza, 99 Bottles, Ulterior @Motiv, and Assembly are participating. The three judges are David Kinch (chef/owner of Michelin 3 Star restaurant Manresa in Los Gatos and owner of Bywater in Los Gatos, he’s a Santa Cruz resident); Sue Slater (Department Chair/Instructor in Cabrillo College’s Department of Culinary Arts and Hospitality Management); and Paul Mekis (Director of Wine for Rosewood Hotels and Resorts and winner of an SF waiters race many years ago). MJA Vineyards is hosting a popup with Ocean2table. There will be several a la carte dishes available featuring Ocean2table seafood and there will be optional wine pairings. Food dishes are subject to change depending on what the fishermen catch on Saturday. All seafood is local, wild and sustainable and all vegetables are local and organic. 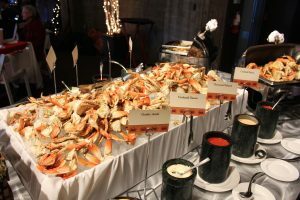 A tentative menu includes sablefish cakes drizzled in spicy garlic aioli; lettuce wraps with pan-fried lingcod, parsnip slaw and chipotle crema; tacos with pan-fried petrale from Half Moon Bay; and wild morel mushroom soup. The Monterey-based restaurant group Downtown Dining (Tarpy’s Roadhouse, Montrio Bistro, Rio Grill) is partnering with the Monterey Bay Aquarium for a benefit. There is free admission and free coffee; tickets for food, beer and wine will be sold at the event. More than 20 chefs are participating including Todd Fisher (Tarpy’s), Tony Baker (Montrio), Cy Yontz (Rio), Michelle Lee and Matt Bolton (C Restaurant+Bar), Yulanda Santos (Aubergine), Tom Snyder (Esteban at Casa Munras); Mo Tabib (The Fish Hopper); Johnny DeVivo (Porter’s in the Forest); Tim Wood (Valley Kitchen at Carmel Valley Ranch); and Angela Tamara (Peppoli at Spanish Bay). Aquarium exhibits will be open during the event. 100% of all proceeds collected will go to those impacted by the fire through the “Soberanes Fire Fund” of the Community Foundation for Monterey County (CFMC). The Community Foundation for Monterey County (CFMC) created the Soberanes Fire Fund to assist communities affected by the Soberanes Fire which began July 22, 2016. Donations will provide both immediate relief and support in the aftermath of the fire.